Goodreads: Nick Stone - deniable operator for British Intelligence - has been assigned to carry out an officially-sanctioned assassination. When he realizes who the target is, he refuses. But he is then given a chilling ultimatum: fly to Central America and finish the job, or the eleven-year-old orphan in his care will get killed. Stone arrives in sweltering Panama close to breaking point. His life is in pieces, but things only get worse when he finds himself caught at the centre of a lethal conspiracy involving Columbian guerrillas. Hundreds of innocent lives are at stake. Their only chance of rescue is Stone. But he has a critically injured friend to rescue, miles of dense rainforest to navigate and the toughest decision of his life to make.. 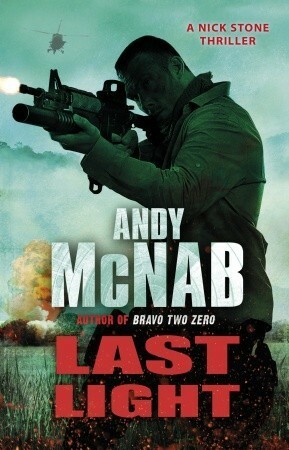 I've loved every Andy McNab book I've read so far and this was no different! When Nick aborts an assassination job he is faced with a ultimatum, finish the job or Kelly dies! Sent to Panama he drives in to the world of corruption and crime. Nick's life is crumbling as he considers what is best for Kelly and how he is going to sort out his money issues and get himself back on track! He even finds himself opening up for the first time. Just when he sees a light at the end of the tunnel he is thrown into a dark world of conspiracies that threatens the life of hundreds of people! In miles over his head will Nick manage to stop a disaster in the making? or is the enemy more powerful than he thought? I Liked this book, Like the others it was action packed and full of adrenaline moments and i couldn't believe it there was a hint of romance for Nick! I love the way Andy builds the story, you see an event happen, then the following consequences and it isn't to the last few chapters where you see the whole story come together! I think there was also an added danger in this book because you knew Nick didn't want to do the job but if he didn't get this right Kelly's life was in danger! And to top it all off he has nowhere near the normal amount of resource he normally has and with injured people to help there are many obstacles for him to overcome. By this stage you have got to no Nick well as a character, in this book you will feel sorry for him because you can see his life falling apart a bit. He is trying to sort himself out and get out the hostel he's been staying at and also sort Kelly's life out! like every other book in the series amazing!!! !